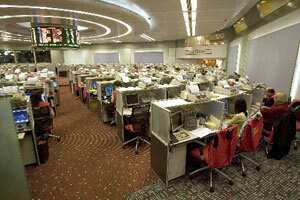 Bangkok: Asian stocks fell on Wednesday after the Federal Reserve offered no new initiatives to help a slowly recovering US economy. Benchmarks in Singapore and Taiwan fell while mainland China rose. US stocks gave up gains Tuesday after the Fed released a policy statement that made clear it was not offering any new steps to help the economy. The Dow Jones industrial average fell 0.6% to close at 11,954.94. The Standard & Poor’s 500 index fell 0.9% to 1,225.73. The Nasdaq composite fell 1.3% to 2,579.27. The Dow dropped more than 70 points in the last hour of trading and had risen as high as 126 points earlier on Tuesday after two strong auctions of European debt. The Spanish government was able to sell short-term debt at much lower interest rates compared with a month ago, a signal that markets are becoming less fearful about the government’s ability to repay its debt. And in its first sale of short-term bills, the European Financial Stability Fund raised €1.9 billion ($2.6 billion). Still, investor sentiment remained fragile amid threats by Standard & Poor’s to downgrade the credit ratings of 15 countries that use the euro because of the region’s debt crisis. “We are likely to continue seeing some cautious trading as the threat of S&P coming out to issue some downgrades at some stage this week looms," said Stan Shamu of IG Markets in Melbourne, Australia. “Some would argue that this is already priced in, but it will still likely rock the boat should it happen." Benchmark oil for January delivery was down 28 cents to $99.86 per barrel in electronic trading on the New York Mercantile Exchange. The contract rose $2.37 to finish at $100.14 an ounce on the Nymex on Tuesday. In currencies, the euro fell to $1.3031 from $1.3043 late on Tuesday in New York. The dollar rose to ¥77.99 from ¥77.97.